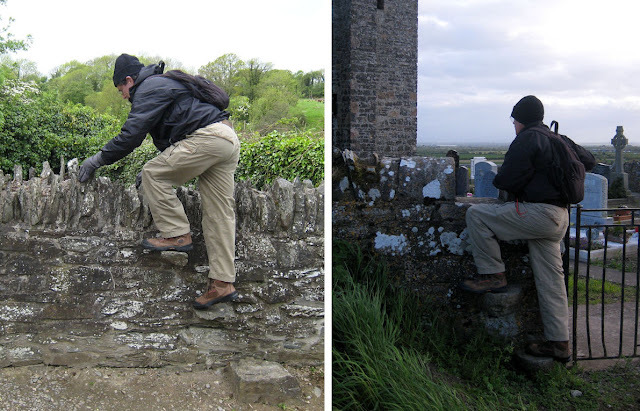 DUBLIN, Ireland — Today we enjoyed some letterboxing in the Irish countryside, thanks to the efforts of some American and British letterboxers. And as so often happens, we have been to some beautiful places. In addition to the incredible scenery, Ireland also has a built-in timing mechanism to let us know when it's time to leave a particular location. 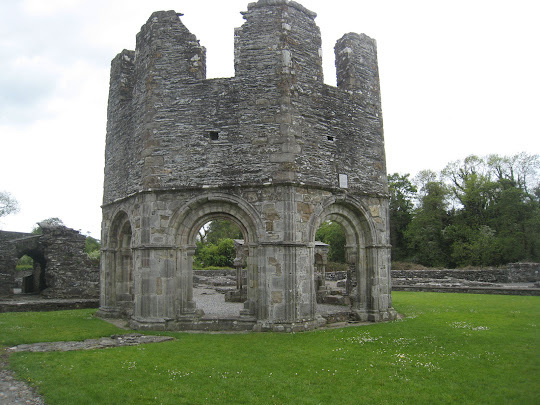 For example, this morning we drove to the site of the Mellifont Abbey. Founded in 1142, the abbey was built on the banks of the River Mattock near the city of Drogheda. It was a model for other abbeys in its day until it was closed in 1539. Today the abbey is a ruin with little remaining except an octagonal 13th-century lavabo (where the monks washed their hands before eating). ﻿After visiting the abbey, we located the letterbox near the ruins of a chapel on the grounds. The box was in the corner of a tiny cemetery that you entered using a very clever and rustic stile, one of two interesting stone wall stiles we came across today. How did we know when it was time to move on to the next letterbox location? The Irish weather told us. When we arrived at the site of the abbey, the weather was quite cool but sunny and remained so while we were touring the site and searching for the letterbox. Almost as soon as we finished stamping in and returned the box to its hiding place, the rain began to fall and we raced to the car. After a brief shower, the sun was back out and the sky was blue, just in time for our search for another letterbox at Dowth Mound in County Meath. 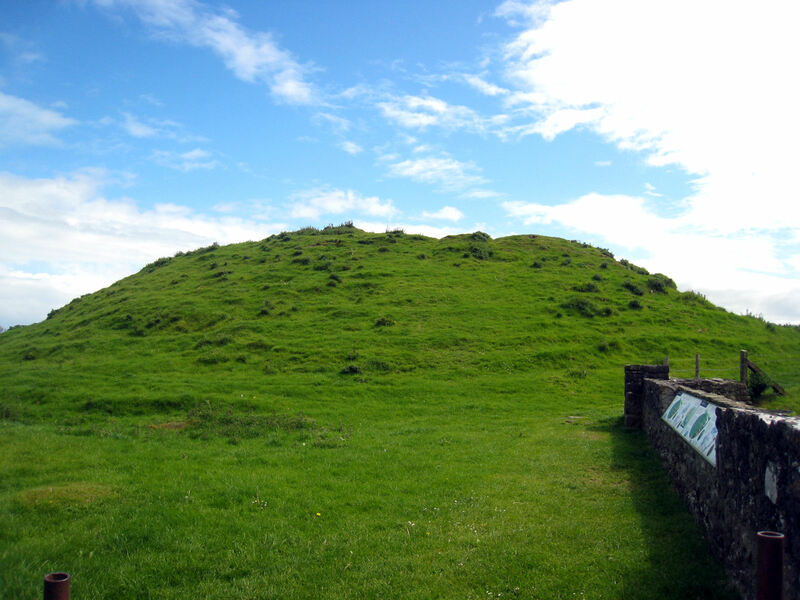 A prehistoric monument, Dowth was built more than 5,000 years ago to house the remains of the dead. It was designed to align with the setting sun on winter solstice, which flooded the tomb with light. Although we found the location described in the clue, the letterbox at Dowth was no longer there. We had searched for some time and knew it was time to quit and move on when the rain began to fall. 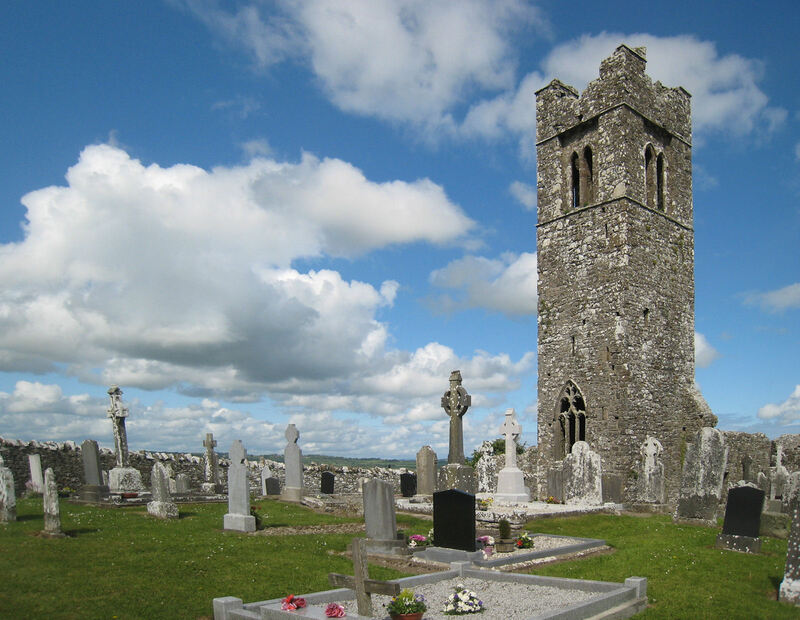 On we went to Slane, a village on the River Boyne that almost expired in the 17th century when the family Flanders emigrated to America and abandoned the village. 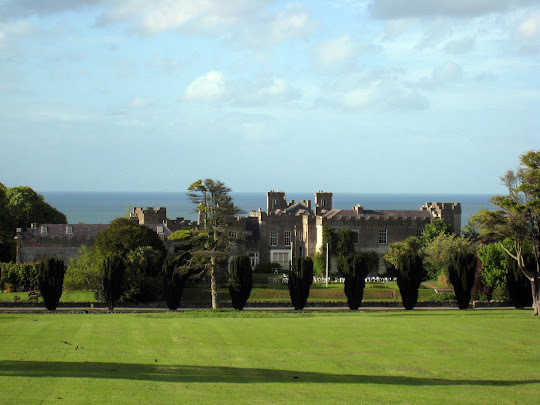 Our destination for the letterbox we were seeking was the Hill of Slane, which is north of the village and stands 518 feet above the surrounding area. Legend has it that St. Patrick lit a fire on top of this hill in the year 433. Ruins of a friary church and college, which were abandoned in the 1700s as well as a beautiful cemetery top the hill. ﻿After waiting for a visiting group of young school girls to leave, we located the letterbox cleverly hidden in a recess behind a tombstone, and just after we returned the box, the rain began. It was almost becoming eerie. From Slane we drove to the village of Skerries on the coast, locating a letterbox near the Skerries Martello Tower and one near Ardgillan Castle in Balbriggan. At both places the rain began to fall after we had completed what we were there to do. How to explain this incredible phenomenon? The letterboxing gods must have been with us? Lady Luck riding in the back seat? Nothing so fanciful, I'm afraid. It's much more likely that we were experiencing typical Irish weather. Because Ireland is an island and is affected by the Gulf Stream, the weather is extremely changeable. In our four days here, we have seen a similar unpredictable pattern every day: sun, rain, sun, rain, sun, rain. This goes on all day, and we've just been lucky enough to letterbox between the showers and enjoy a sample of the stunning Irish countryside.